FitQuest brings full bio-mechanical lab technology to the gym or corporate wellness centre. It can be used by gym goers to assess their own fitness progress, personal trainers to monitor client achievement and operators to improve member engagement. FitQuest not only measures individual parameters, but provides an overall fitness assessment known as the Fitness Quotient, or simply FQ. To help your members understand the results, we have converted the data into a unified fitness score, similar to the IQ test for intelligence. 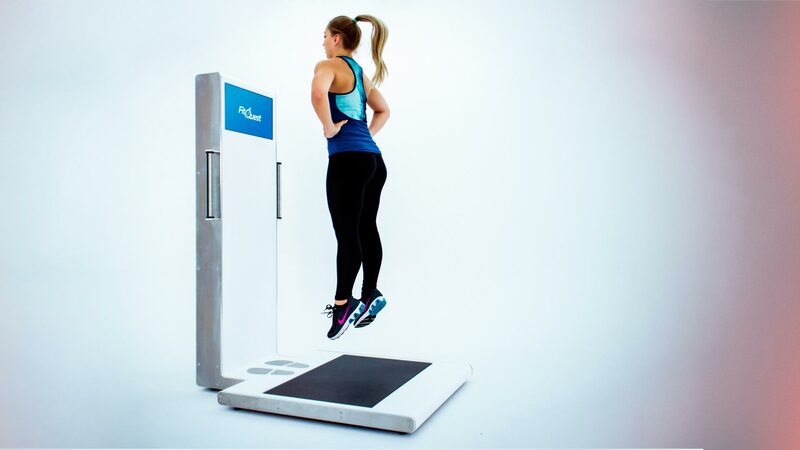 The FitQuest system incorporates an advanced measurement force platform, biometric stainless steel handles, biometric foot plates with a user-friendly touch screen interface and a custom computer which runs MIE’s unique algorithms. This is housed in a strong steel chassis encased in an easy clean and hard wearing outer case to minimise maintenance. The FitQuest machine sends results to our cloud database allowing users to access their measurement results and track their fitness progress trends on their desktop PC, tablet or smart phone through our web portal solution, FQscore. FQscore is your digital solution for member engagement, keeping your operation relevant in a rapidly changing fitness and wellness world. Enriching the fitness journey of gym members worldwide! FitQuest has partnered with a number of organisations to support their customers in the fields of research, medicine, health and fitness. We pride ourselves in providing the best quality equipment, data and analytics to ensure our partners and their end users receive an exceptional experience.